The good thing about burning the candle at both ends is that it gives you the chance to see your plans go up in smoke at both 5am and midnight. Frankly the last Sunday in October couldn't have been a longer day than yesterday. I'd already planned to get up early yesterday morning and head into work for some more overtime, but as it turned out, Lisa and I had the pleasure of being woken up at 4:45am by someone ringing the loud buzzer on our external intercom. I'm not sure if they were drunk, mental or just dangerous, but my money was on all three, so we refused to let them in. At which point they rang everyone else in the block. By 5:15am I'd realised I wasn't going to get back to sleep, so I decided to make hay before the sun came up, and head into work. I was at my desk just after six, and worked until half past nine, at which point I returned home to look after Toby while Lisa and Am went to church. Having already earned some money that morning, I decided to continue in that vein by selling a leather jacket of mine on eBay, which meant attempting to take some classy-looking photos while Toby attacked me with a coat hanger. Lisa and Amelie returned home at 12:20pm, which gave us half an hour to have lunch before Am and I headed down to the swimming pool for a ninety minute lesson. We were back home at three, at which point I started the hoovering and housework. 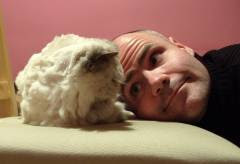 By 8pm, the kids were in bed, I was in my pyjamas, and the only thing on my mind was an early night. At which point the phone rang. It was Lisa's Mum, informing us that she was standing in a pool of blood, and an ambulance was on its way. Which was surprising, as it's not April the 1st for another week. When she had her eye operation last Wednesday, they warned her that some bleeding was to be expected (which explains why we had to throw out one of our pillows), but told her that if blood suddenly started pouring out of her nose uncontrollably, she should go straight to A&E. Which is what I like to call the bleeding obvious. Sure enough, at about 8 o'clock yesterday evening, she bent down to get an ice cream out of the freezer, and blood started gushing from her face. Thus proving that Cornettos are bad for you. Fortunately we live about a hundred yards from A&E, so despite having called us second, I was fully dressed and standing at the reception desk a full fifteen minutes before the ambulance arrived and my blood-soaked mother-in-law was wheeled into the hospital. I said last Friday that she looked like Sylvester Stallone at the end of 'Rocky'. Well yesterday evening she looked more like The Evil Dead. But with more blood. The bleeding itself had stopped by the time she got to hospital, but that's possibly because she had seven pints on her dress. 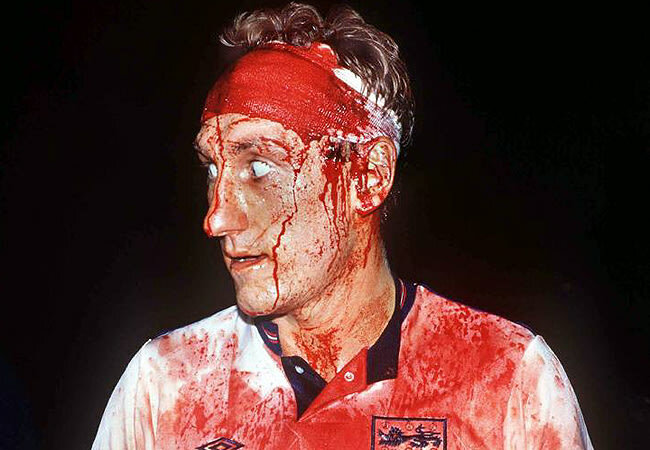 The paramedics (who were lovely, I must say) had strapped a wad of gauze to her face, and she reminded me of Terry Butcher in a World Cup qualifier. Fortunately, despite looking like the most seriously injured person in casualty, my mother-in-law was surprisingly perky, and started asking me how *I* was. Unfortunately, just as I was about to fill her in on the challenges of doing overtime at 6am, my window of opportunity was closed by Lisa's sister, who turned up at A&E, saw her Mum, and promptly burst into tears. I ended up having to give her my chair. Before my mother-in-law did. Anyhoo, to cut a long story short, I stayed until Lisa's Mum was seen by a nurse and moved into a cubicle, but when someone turned up to undress her, I decided it was time to leave, and handed responsibility to my sister-in-law and her husband. Which meant I'd gone by the time the bleeding started again, and she vomited blood. I'm not sure what time I got home. It felt like midnight, but wasn't. Lisa's Mum stayed in hospital overnight, but was discharged at lunchtime today, and has come back to our flat. We have nothing worth eating in the bottom of our freezer, so she should be quite safe. She's due back at the Eye Hospital on Friday, so we might insist she stays until then, otherwise she'll be on the first bus into town in the morning, and having nose bleeds in Marks & Spencers. I'll be strapping her to the sofa shortly and heading over to the sheltered housing to pick up her clothes. Her current outfit is technically clinical waste, and needs prompt incineration. But she was bending down to pick up the children's toys the day after her op! How does the freezer cause such a dramatic effect?? Even the thought of a Cornetto brings a blood rush to the nose, I suppose - but blimey, how awful. I've been feeling quite sorry for myself and only getting a couple of hours' sleep a night because of *difficult* parent issues, but I now feel a complete wuss. Love and all that soppy stuff to all of you.